I recently came across this nice animated gif of a fractal based on a Steiner chain, due to Eric Martin Willén. I immediately wanted to replicate it. First, how do you make a Steiner chain? It is easy using inversion geometry. 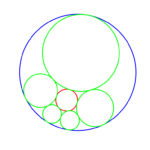 Just decide on the number of circles tangent to the inner circle ( ). 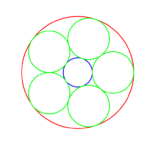 Then the ratio of the radii of the inner and outer circle will be . The radii of the circles in the ring will be and their centres are located at distance from the origin. This produces a staid concentric arrangement. 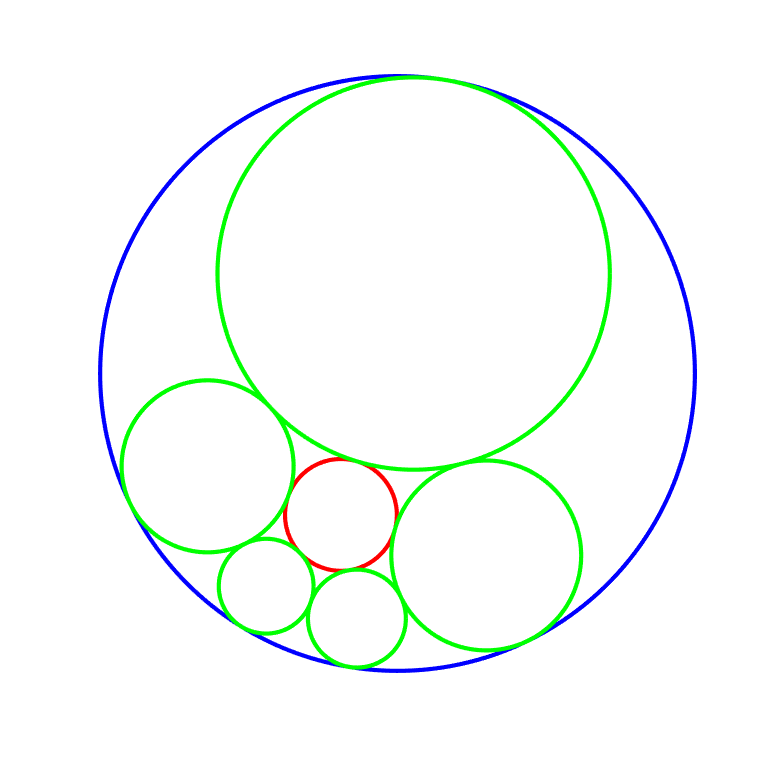 Now invert with relation to an arbitrary circle: all the circles are mapped to other circles, their tangencies preserved. Voila! A suitably eccentric Steiner chain to play with. Since the original concentric chain obviously can be rotated continuously without losing touch with the inner and outer circle, this also generates a continuous family of circles after the inversion. This is why Steiner’s porism is true: if you can make the initial chain, you get an infinite number of other chains with the same number of circles. The fractal works by putting copies of the whole set of circles in the chain into each circle, recursively. 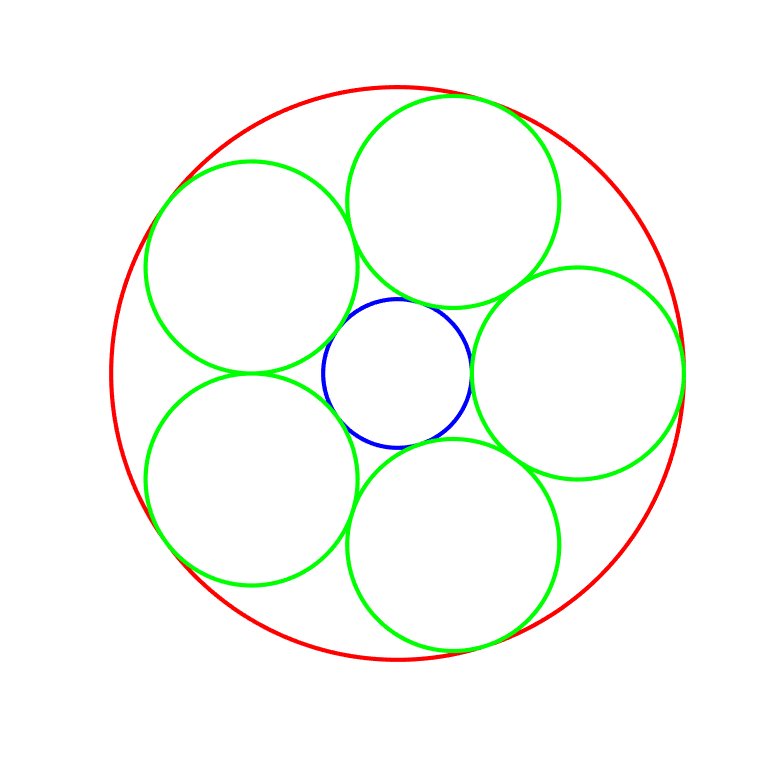 I remap the circles so that the outer circle becomes the unit circle, and then it is easy to see that for a given small circle with (complex) centre and radius the map maps the interior of the unit circle to it. Use the ease of rotating the original concentric ring to produce an animation, and we can reconstruct the fractal. Except… it feels a bit dry. Ever since I first encountered iterated function systems in the 1980s I have felt they tend towards a geometric aesthetics that is not me, ferns notwithstanding. A lot has to do with the linearity of the transformations. 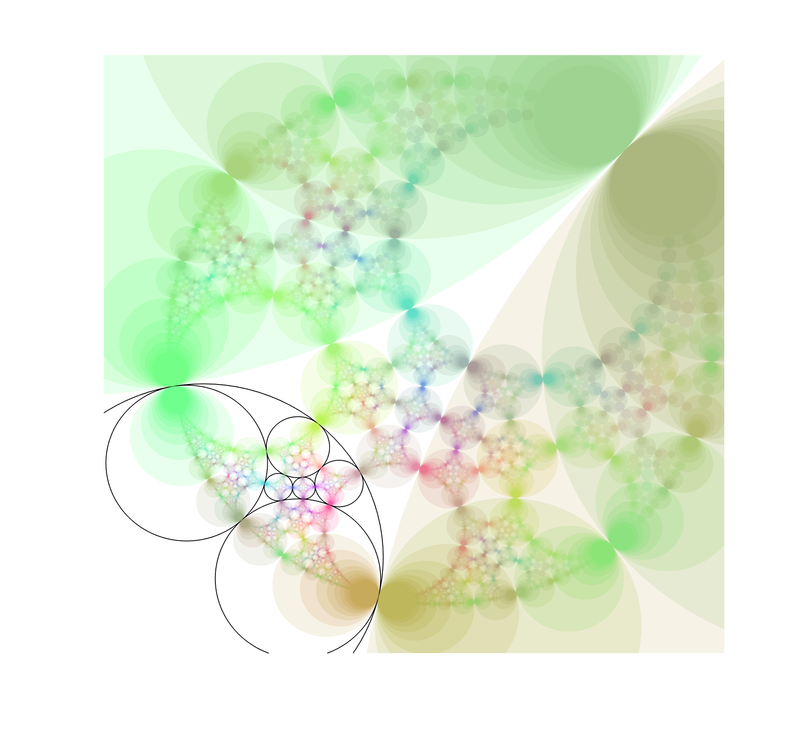 One can of course add rotations, which cheers up the fractal a bit. But still, I love the nonlinearity and harmony of conformal mappings. 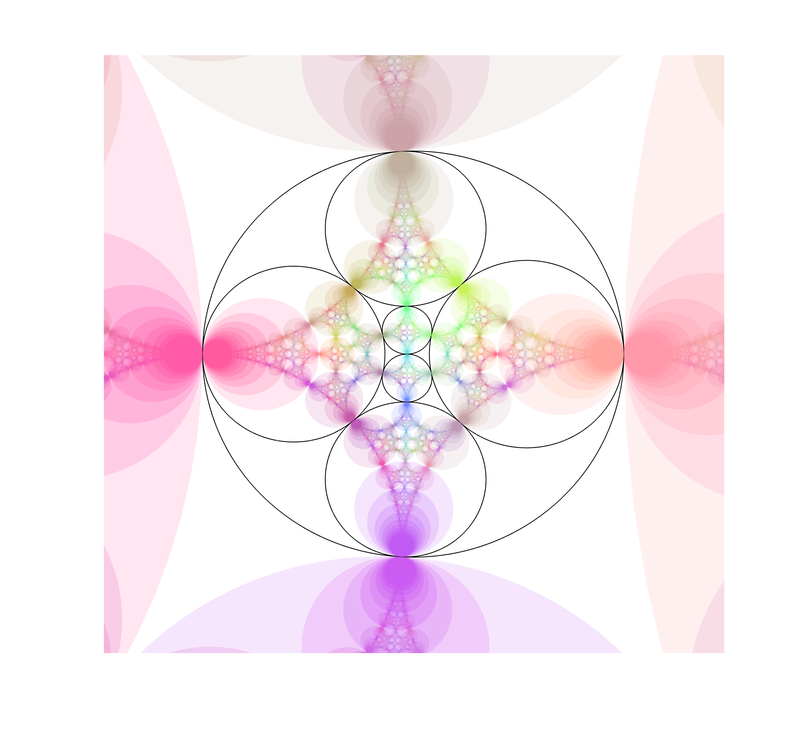 Enter the circle inversion fractals. They are the sets of the plane that map to themselves when being inverted in any and all of a set of generating circles (or, equivalently, the limit set of points under these inversions). As a rule of thumb, when the circles do not touch the fractal will be Cantor/Fatou-style fractal dust. When the circles are tangent the fractal will pass through the point of tangency. 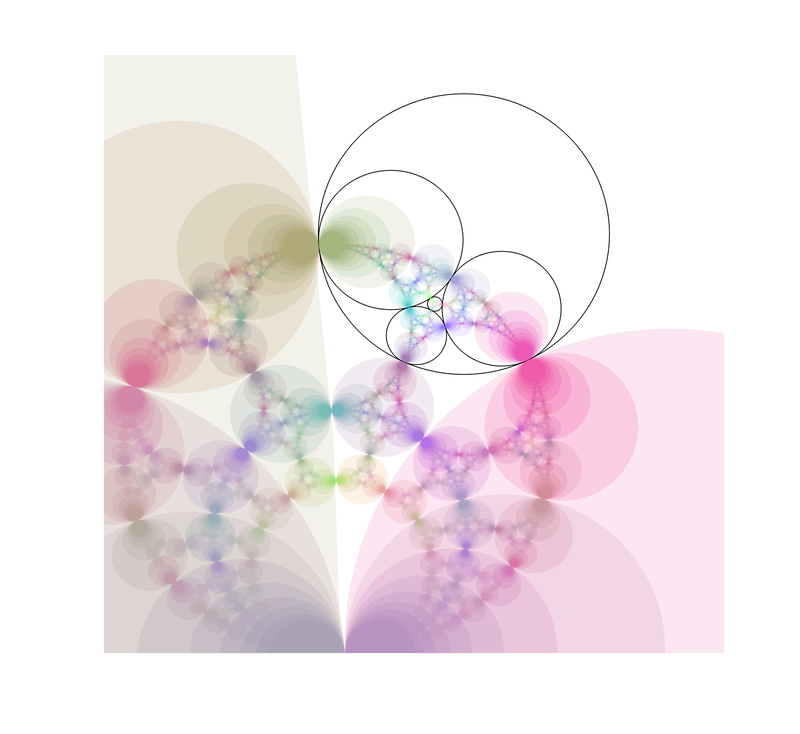 If three circles are tangent the fractal will contain a circle passing through these points. Since Steiner chains have lots of tangencies, we should get a lot of delicious fractals by using them as generators. 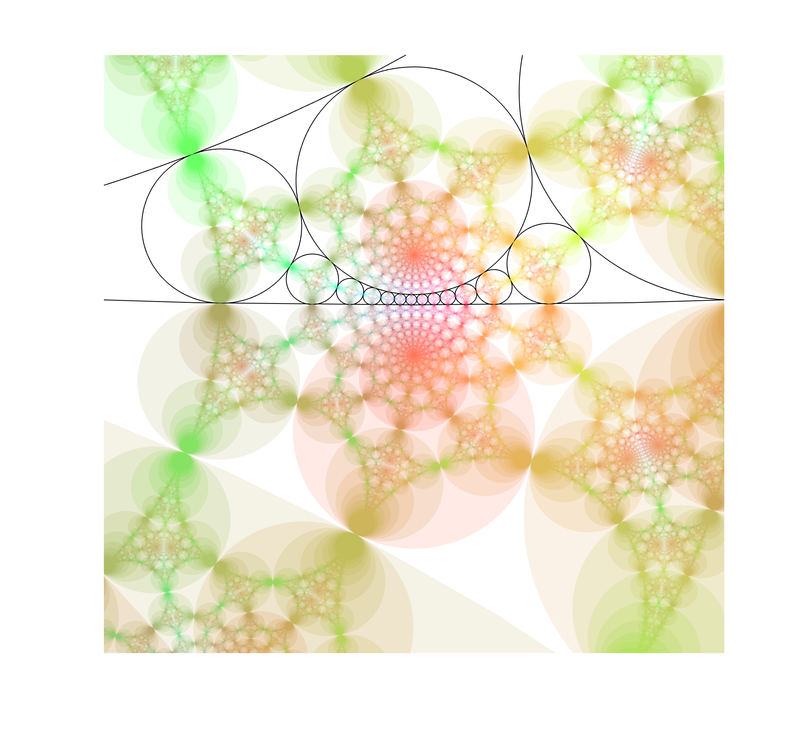 I use nearly the same code I used for the elliptic inversion fractals, mostly because I like the colours. 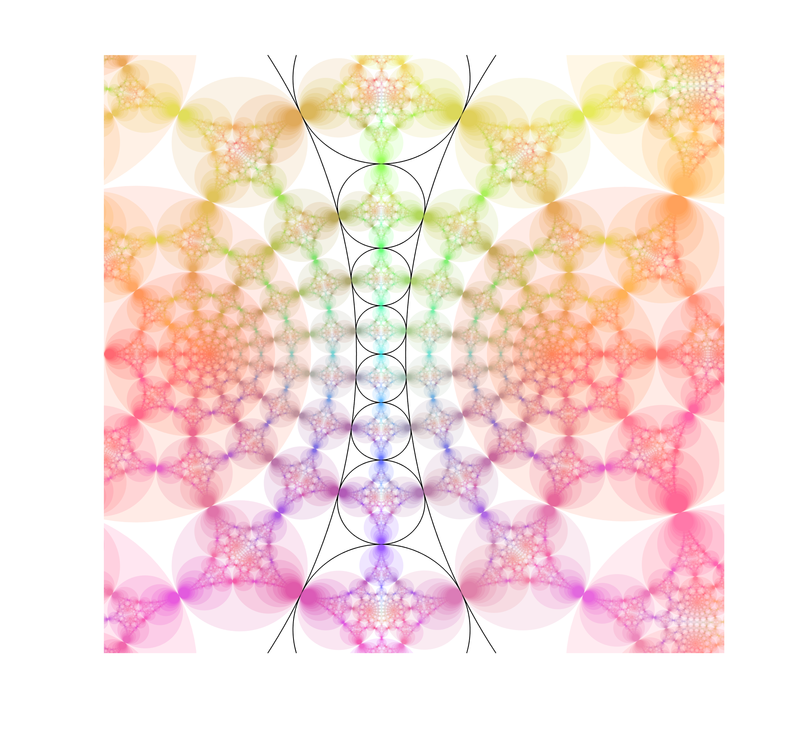 The “real” fractal is hidden inside the nested circles, composed of an infinite Apollonian gasket of circles. Note how the fractal extends outside the generators, forming a web of circles. Convergence is slow near tangent points, making it “fuzzy”. While it is easy to see the circles that belong to the invariant set that are empty, there are also circles going through the foci inside the coloured disks, touching the more obvious circles near those fuzzy tangent points. There is a lot going on here. But we can complicate things by allowing the chain to slide and see how the fractal changes.